It’s always a difficult decision to make each season – which varieties to grow this summer – especially if space is limited. Here is my Tomato Seed Choice 2019. There are three varieties that are really worth considering if you regularly suffer from blight. These are: Crimson Crush (tall, medium-large fruit) with a great yield and taste for a larger variety. It has been bred for outdoor growing and is highly recommended by everyone who grows it! More about Crimson Crush Seeds here. Mountain Magic (tall cherry) from T&M. A good size cherry tomato with a fine taste. Similar to Gardener’s Delight but with less acid content. LIzzano, a vigorous, trailing cherry variety from Suttons. This is the cherry to grow for blight resistance – say goodbye to blight even in the wettest season! Each variety is blight resistant (not just blight tolerant) and contains the genes that prevent the fruit from becoming affected. It seems that we are experiencing wet summers over recent years in the UK. If you grow tomatoes outside then growing at least one blight free variety is highly recommended! More about blight resistant tomato seeds here. However, there are many recent varieties that will produce plants that are more vigorous and with more disease resistance namely the F1 medium tomato varieties. When considering tomato taste, it is important to give a tomato variety a few seasons to show what it can do – especially when growing outdoors. A poor season will produce a poor taste – even in reliable varieties. The amount of sun on our tomato plants has a big influence on sugar and acid content. Of course the amount of sun we receive each summer can change dramatically from season to season! Two great varieties that do very well under cover and outside In good season. Some of the sweetest tomatoes are the Sungold type. Cherry varieties that were bred in Japan such as Suncherry Premium, Suncherry Extra Sweet and Golden Cherry. These have a great sweet taste but for some growers, lack the balanced old fashioned flavour that includes acid content. Rosella (below) is a very sweet cherry that has a rose dark skin and is growing in popularity – it has a better balance of sugar/acid unlike the other tomatoes in this category above. Black Opal is another new variety that is a cross between Black Cherry and Sweet Aperitif – I’m looking forward to trying this one! 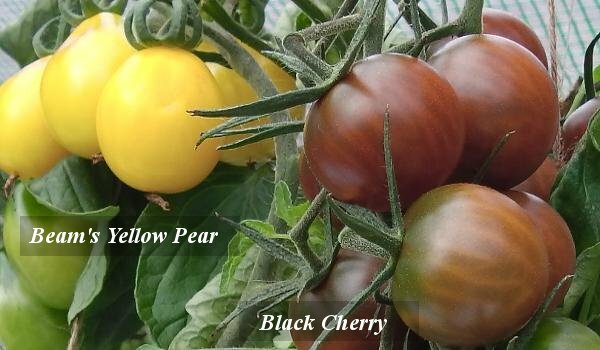 Three dark cherry varieties that are well worth growing this season! Moneymaker is an old Heirloom or Heritage variety which is very reliable when grown in the UK. For years there have been discussions over its taste. Some gardeners think it is rather bland in flavour while others find it very good. The taste also depends on the season too of course. Gardener’s Delight is probably the most popular of these three old varieties. It has a well balanced taste with plenty of intensity. Moneymaker can be rather bland tasting, but is as reliable as they come. Yellow varieties such as Golden Sunrise usually have a slightly less intense flavour but look fantastic in a salad! It is possible to increase the flavour of a tomato variety by using feeding and watering methods that increase the flavour intensity. Over watering is a sure way to reduce the flavour of your tomatoes! When choosing which large varieties to grow, Marmande is a good choice but F1 hybrids like Big Boy are vigorous and will usually do better in a poor summer. Growing larger tomatoes takes a bit more experience than growing smaller cherry varieties. Crimson Crush is blight resistant and is my top tomato seed choice 2018. It is easy to end up with just six big ones and the rest just peter-out. See Tips for Growing Large Varieties. If you like the cascading/trailing types that are ideal for hanging baskets, any of the Tumbler varieties such as Tumbling Tom and Tumbler will be ideal. 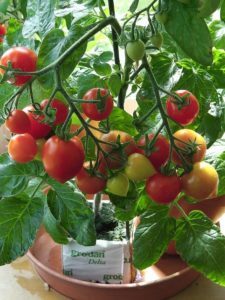 It is important not to put too many tumbler type tomato plants in a hanging basket because you’ll get better results from plants that aren’t crowded. One, two or three maximum – the more plants in a hanging basket, the more often you’ll need to water on a warm day. More about hanging basket tomatoes. 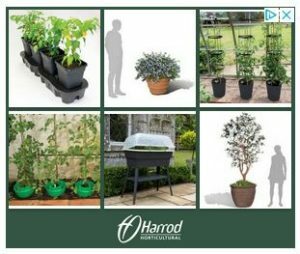 These tomato plants can be grown in a six inch pot. They are upright and compact in growth habit and need staking because their main stems aren’t strong enough to support the weight of the tomatoes. If you have room for a slightly larger pot, 7 or 8 inch, you will probably get better results. Either way, growing your own tomatoes on the windowsill is great fun and the taste of a freshly picked cherry is second to none! 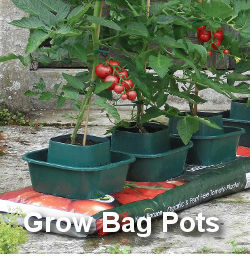 Heartbreaker growing in 3 inch Grodan cube – you don’t need lots of soil to grow tomatoes! Other varieties in the Windowsill category include Balconi Red and Yellow, Micro Tom, Pot Minibel and are all fine in a 6 inch pot. More about Growing Dwarf Varieties. A browse through the seed catalogues will give information about each variety, but it’s best to choose ones that do well in your area. If the tomatoes have an Italian name, they are probably best grown in a warmer climate than the UK. More about growing tomatoes from seed, LED grow lights and seed germination.